Funny, how things sometimes happen. I was just reading about Spittlebugs when I walked out into my Phoenix desert garden and found…Spittlebugs! What looks like…yes, spit…at plant nodes is actually hiding the feeding nymphs of the adult Spittlebug. They can attack almost any of our xeriscape plants, but they favor herbaceous, woody plants and conifers. This happens to be a Salvia greggii which can be susceptible to these guys. The adults are probably long gone…they’ll jump or fly when disturbed…leaving behind their plant-sucking nymphs. A heavy infestation can affect plant tissues and slow growth, but often the infestation is occasional and not threatening to the plant. Here’s the best gardening tip I have: simply spray the stuff off with a hose. If taking a more extreme approach suits you better, you can prune off and dispose of the affected parts of the plant. But this is a tough thing to do when the temp outside is 109 degrees! 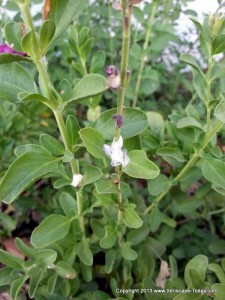 Plus, the pruned areas can then attract aphids…which you’ll probably want to remove with a mild soap. Here in the Phoenix desert, we take our water conservation seriously. Yes, we have excellent water management. But we also boast some 400+ golf courses in Arizona, with Phoenix and Scottsdale weighing in heavily, and a “lake” that loses boatloads of water through evaporation. So when I set my sprinkler to sprinkling, it freaks me out to forget about it. Four hours later, there’s a river running down the street and as I curse the source of the tributary, I realize it’s me. It’s hard to escape my wrath. But more than wasted droplets streaming down the street, I see dollar signs…which the City of Phoenix is only too happy to reinforce when they send the water bill. We will install a drip irrigation system someday. In the meantime…hose timers! These are so simple, they’re brilliant. 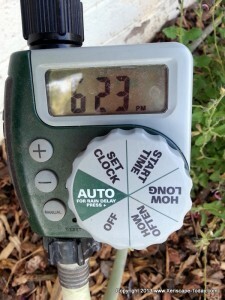 This really easy Orbit Garden Hose Timer serves a new desert garden with xeriscape plants that I just installed. I took a soaker hose and weaved it in and around my new plants, and then tacked it down with fabric pins . (These are normally used for tacking down landscape fabric). I covered everything with mulch. Then I attached one end of a hose to the soaker hose, and the other end to the hose timer (which is connected to the faucet). I set the timer and…it waters automatically! I have no idea how I missed this this innovation. So, if you don’t have a drip irrigation system, this is the next big thing. Even if you do have a drip system, this is an easy solution for that out-of-the-way garden…or even a veggie garden…that isn’t served by your drip system. More to come on creative watering…there’s so much more out there that isn’t available at the big box stores! I kill lavender. Or at least I used to. Turns out I was committing one of the two deadly sins of lavender: showering them (literally) with love and planting them directly into the compacted clay soil that many of us in the Phoenix desert must contend with. So I took an “All About Lavender” class at the Desert Botanical Garden to deal with my heinous ways. Here’s what I learned from Master Gardener Pam Perry: lavenders are excellent xeriscape plants that like it high and dry. I’d already planted my lavender on mounds, allowing excess water to easily run off. Lavenders also have pretty good root systems so you can water around the bottom of the mound (for an already established plant) and their roots will take up the water. If planting on mounds isn’t a option, try amending your soil with little compost to help with drainage. For lavender in containers, use a cactus mix. What??? I know, that’s what I thought, too! But a cactus mix provides better drainage than regular ‘ol potting soil! This I will need to try on my surviving-not-thriving lavender in containers. I suspect that the Desert Botanical Garden will offer the lavender class again next year, but they have an awful lot of good classes in the meantime, so check their website for an up-to-date class schedule….and just go!